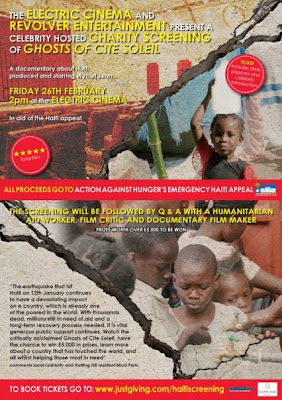 Revolver Entertainment are holding a charity screening of Wyclef Jean’s ‘Ghosts of Cite Soleil’ at the Electric Cinema on Friday 26th February in aid of Action Against Hunger’s emergency Haiti appeal. The event will be hosted by Martine McCutcheon and Mica Paris and there will be a Q&A session with a film critic, an Aid specialist and a British documentary maker following the screening along with a charity auction. This ‘raw, painful documentary’ [The Observer] takes a gritty look at the reality of life in Haiti, produced by, and starring Haiti born musician Wyclef Jean. 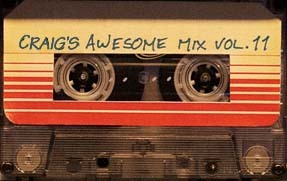 Other celebrities confirmed to attend include Cerys Matthews, Charlie Brooks, Status Quo, Duran Duran, Boy George, Tazmin Outhwaite and Jenni Falconer. 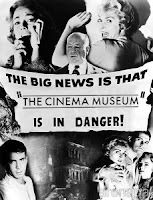 The celebrity hosted screening will take place at 2pm on 26th February at The Electric Cinema in Notting Hill. The screening will be followed by a Q & A hosted by a Film Critic, an Aid Specialist, who has over 10 years of experience in humanitarian crisis zones, and a British Documentary Maker. There will also be the opportunity to win over £5,000 worth of prizes, including an exclusive Kingdom of Heaven limited edition Ridley Scott framed and signed print, a bike, a one year Cineworld pass, dinner for two at the exclusive Electric Brasserie, celebrity worn designer clothes, and much more.